It’s November, but you all know that. Having cricked my back cutting the hedge the other week and then made it much worse with a (fishless for me) trip to the coast with Bill and Nigel, I’ve been banned from fishing until I recover. To make things worse my pals have continued to fish and – do you believe it – they’ve been catching? On the second of the month Nigel went for a short evening session to a shingle/rocky beach. 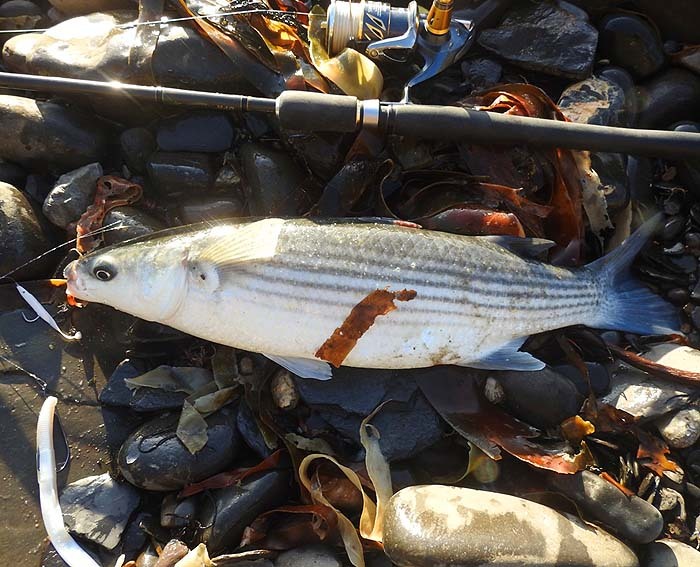 He reports that "There were a couple of big banks of maggoty weed on the shore, loads of sand smelt in the sea and that he "...saw a couple of "blitz's" from bass(?) 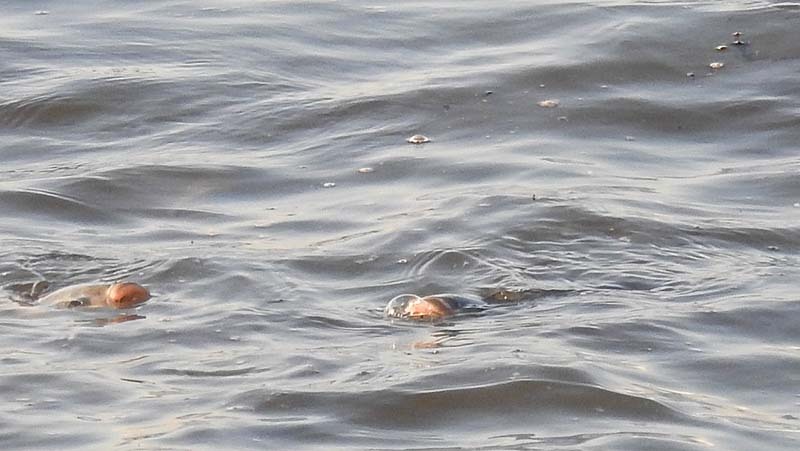 but nothing would take any of his lures lure except four small pollack at distance on a 10g wedge and a gar that left the tip of its bill jammed in the split ring (amazing!!!)." He saw no mullet but says that the tide was too small and too late. A couple of days later he went again to the same spot but this time he opted for an early morning session from 05:45 to 09:00hr. The wind was blustery from the west and big swells built up after the tide turned. This time he landed more than ten bass ranging in weight from 3lb to 4.5lb and a four pound mullet. Two thirds of the bass took a 7” Slug-Go, three bass and the mullet were caught on a maggot fly and a couple of bass were landed on a Delta eel and a “Dancing Eel”. Bill went to a different (rocky) beach on the same morning as Nigel’s bonanza. 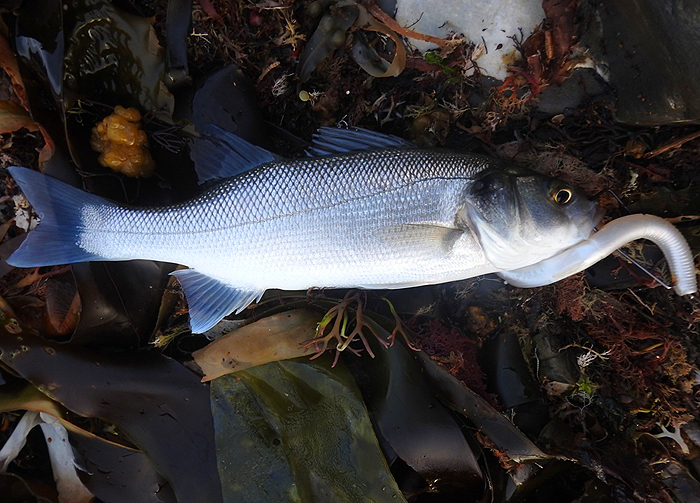 He spun from 08:30 to 10:45 and caught a thick lipped mullet of 3lb 10Oz (weighed) on a Delta eel used as a dropper in front of his Slug-Gill which produced a three pound bass. Needless to say, although I’m pleased to hear of my mates catching a few and Bill took some good pictures, it’s a bitter pill to swallow when I can’t go myself. Patience Mike! 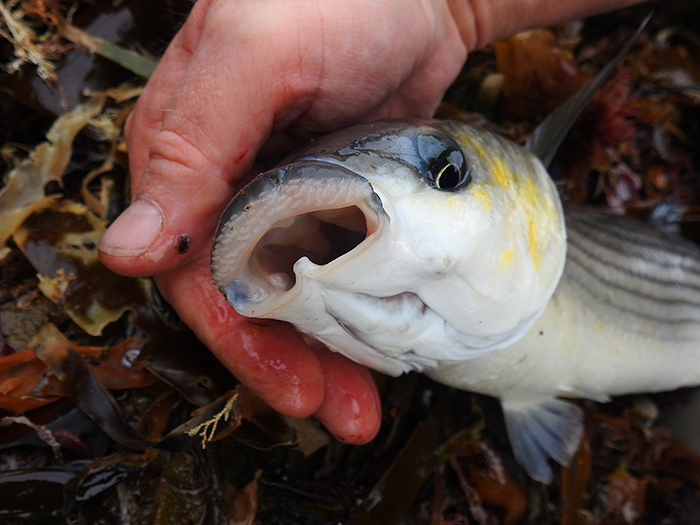 Really nice picture of maggoting mullet - note the pink lips. Bills mullet taken on the Delta - unusually they quite often take lures in November. Bill's bass on the Slug-Gill lure.